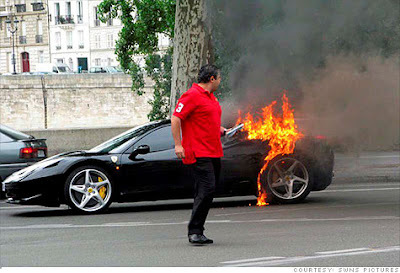 NEW YORK (CNNMoney.com) -- Ferrari is recalling its new 458 Italia model after several vehicles were reported to have burst into flames. The heartbreaking story is here! I like to collect life experiences, and next month I'll be adding another one. I'm going to Southern California for a weekend get-away. I thought it would be fun to see a TV show, so I requested a ticket to the Tonight Show With Jay Leno. They have a lottery system where viewers are chosen from all who make a request. Today I found out that I'm going! At least I think I am. The show always overbooks in order to assure themselves of a full audience. It's first come-first admitted. I'll go early, but not crazy early. I hope that someone good will be on the show and not some politician or starlette. One of my favorite musicians, Derek Trucks, is on the show tonight. I wish he could have waited a month. Oh well. I Won A Blog Contest!